Home > Shop by Brand > Pinnacle Natural Brilliance > BUY ONE - GET ONE FREE - Pinnacle Advanced Tire Cleaner > Pinnacle Advanced Tire Cleaner - 128 oz. Effectively removes dirt and contamination to bring back the fresh look of new tires! Penetrates deep into the pores of the rubber, breaking the bond of deeply rooted contamination. Removes the discoloring or browning that affects most tires. Show your tires the Pinnacle of clean! Pinnacle Advanced Tire Cleaner effectively removes dirt and contamination to bring back the fresh look of new tires! The formulation of Pinnacle Advanced Tire Cleaner penetrates deep into the pores of the tire to remove everything from old tire gels to dirt and road grime. The powerful formulation is safe for any kind of tire and won�t discolor . 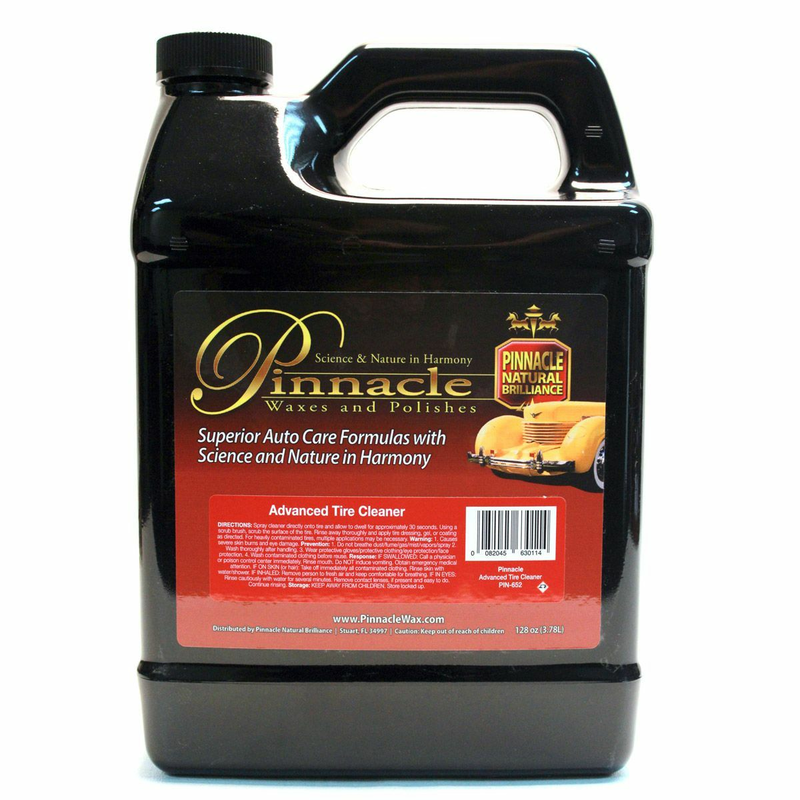 In fact, Pinnacle Advanced Tire Cleaner will remove the discoloring or browning that affects most tires. If you are in search of a more effective tire cleaner, your search is over! Creating a show car shine takes a lot of time and effort. Decontamination, compounding, polishing, sealing the paint, and caring for the trim all blend together to create a uniform image of beauty, also known as a show car shine! So, why would you be meticulous with the rest of the car and neglect the tires? That�s like wearing a thousand-dollar suit and putting on dollar store flip flops, it just doesn�t make sense! 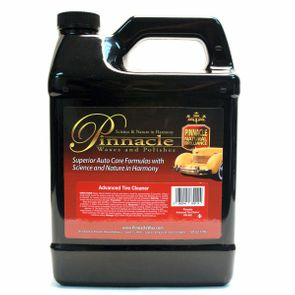 It�s time to treat your tires with the care they deserve, and that is with Pinnacle Advanced Tire Cleaner! Commonly tires are dressed with a tire gel or dressing to give a wet or natural look and protect from UV damage. Unfortunately, over time these dressings or gels dry out and fade. What was once a glorious shine has now been reduced to unsightly browning. Don�t fear, this is what Pinnacle Advanced Tire Cleaner was born to do! Once it hits the surface of the tire, Pinnacle Advanced Tire Cleaner get right to work. During the recommended 30 minute dwell time, you will see the product start to work, eradicating tire contamination to restore your tires back to their former self! The cleaning power of Pinnacle Advanced Tire Cleaner isn�t limited to cleaning off old tire gels. Tires are constructed of porous rubber, and while this is great for traction, it tends to accumulate and store road contamination in the tire itself. This is where many standard tire cleaners struggle. Pinnacle Advanced Tire Cleaner penetrates deep into the pores of the rubber, breaking the bond of deeply rooted contamination. Spray directly onto tire and allow to dwell for 30 seconds. Using a tire scrub brush, agitate the surface of the tire. Rinse thoroughly and apply your choice of tire dressing, gel, or coating. Heavily contaminated tires multiple applications may be necessary.